I'm taking a current baseline of key VCDS measurements for my 2011 Audi A4 with the CAEB 2.0t engine with an 8-speed automatic transmission. No modifications. 88k miles. I came across a potential anomaly when measuring IDE01932, High pressure pump injection volume mm3. Logging was performed at WOT in 3rd gear with numerous runs. Per the graph below, the injection volume as observed today is significantly lower than when I logged the same ID three years ago. What is the expected range for Injection Volume values? Is this a command/expectation or observation/result value? 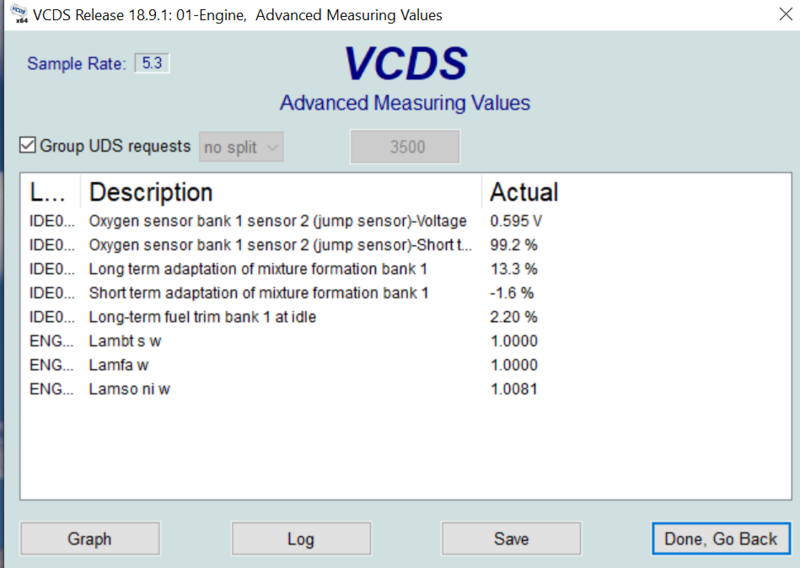 Which sensor monitors Injection Volume? 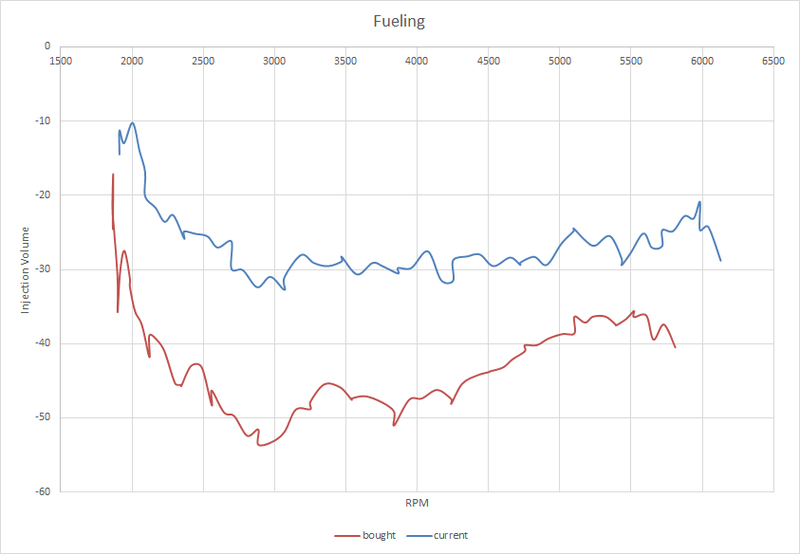 All other measurements I took (fuel pressure, boost, timing, AFR, Load, wastegate, etc.) look as expected and I'm trying to confirm whether my fueling works as expected or do I have a HPFP or injectors issue. Any insights or comparison logs would be greatly appreciated. - If there is no "specified value" listed in the Advanced Measuring Values, it would appear it is not possible to know. - I would speculate the "High pressure pump injection volume (mm3)" is a calculated value, since there is no sensor for fuel volume, only pressure pressure. - Where the conditions the exactly the same three years ago as they were during the last baseline tests? I am thinking that normal powertrain wear, fuel formulas, ECM strategies and other conditions (atmospheric and others) could be the cause of the "potential anomaly". Is there anything wrong with the vehicle? It would be helpful to post up an Auto-Scan of the vehicle in question when asking such questions. This question would be best answered by the people who designed the system. Thank you for the response, drpeter. Regarding test conditions, I kept all variables as consistent as possible: same stretch of highway, same gear, etc. Over the years, major work was performed to the car, including oil consumption stage 1 and 2 fix (PCV, pistons and rings), timing chain and tensioner replacement. Car still has original HPFP and injectors. I'm at 5000ft altitude which affects charge pressure and air flow readings. I inspected the intake valves via borescope and see a good amount of carbon build-up. Already did an intake pressure test to check for air leaks which passed. I still need to inspect for any exhaust leaks. Car is at 90k miles and a carbon cleanup of the intake is on the horizon and I'm contemplating replacing the fuel injectors at the same time. Bottom line, I'm trying to gauge whether the car operates within expected ranges and learn more about ECU management in the process.